Gordon is an international key note speaker, coach and entrepreneur. 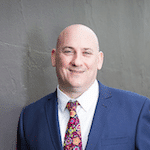 He has over 20 years working for and advising organisations in high growth opportunities including advisory services, mentoring, leadership and succession planning. Today he shares his insights as to how organisations and people can be visible to their network creating a tactical and strategic advantage. He is widely known as The Visible Guy. Gordon is managing director of Adaptive Innovation, a management consultancy group and 2016 Indi Company of the Year. In addition to Chair of Lungitude Foundation, Gordon is non-executive director of DIG Ltd, a digital innovation firm and was a board member of the Margaret Pratt Heart Lung Research Transplant Foundation for 8 years. Gordon’s wife Wendy Jenkins is a lung transplant recipient which one of the driving forces behind his involvement with the Lungitude Foundation. Gordon holds a BSc (Hons) Systems Modelling and various qualifications specific to the Australian Financial Services industry.